Audio power is the electrical power transferred from an audio amplifier to a loudspeaker, measured in watts. The electrical power delivered to the loudspeaker, together with its efficiency, determines the sound power generated (with the rest of the electrical power being converted to heat). Amplifiers are limited in the electrical energy they can output, while loudspeakers are limited in the electrical energy they can convert to sound energy without being damaged or distorting the audio signal. These limits, or power ratings, are important to consumers finding compatible products and comparing competitors. 3.1 Continuous power and "RMS power"
In audio electronics, there are several methods of measuring power output (for such things as amplifiers) and power handling capacity (for such things as loudspeakers). Voltage: The amp's power supply voltage limits the maximum amplitude of the waveform it can output. This determines the peak momentary output power for a given load resistance. Current: The amp's output devices (transistors or tubes) have a current limit, above which they are damaged. This determines the minimum load resistance that the amp can drive at its maximum voltage. Temperature: The amp's output devices waste some of the electrical energy as heat, and if it is not removed quickly enough, they will rise in temperature to the point of damage. This determines the continuous output power. As an amplifier's power output strongly influences its price, there is an incentive for manufacturers to exaggerate output power specs to increase sales. Without regulations, imaginative approaches to advertising power ratings became so common that in 1975 the US Federal Trade Commission intervened in the market and required all amplifier manufacturers to use an engineering measurement (continuous average power) in addition to any other value they might cite. For loudspeakers, there is also a thermal and a mechanical aspect to maximum power handling. Thermal: Not all energy delivered to a loudspeaker is emitted as sound. In fact, most is converted to heat, and the temperature must not rise too high. High level signals over a prolonged period can cause thermal damage, which may be immediately obvious, or reduce longevity or performance margin. Mechanical: Loudspeaker components have mechanical limits which can be exceeded by even a very brief power peak; an example is the most common sort of loudspeaker driver, which cannot move in or out more than some excursion limit without mechanical damage. There are no similar loudspeaker power handling regulations in the US; the problem is much harder as many loudspeaker systems have very different power handling capacities at different frequencies (e.g., tweeters which handle high frequency signals are physically small and easily damaged, while woofers which handle low frequency signals are larger and more robust). Though a speaker is not purely resistive, these equations are often used to approximate power measurements for such a system. Approximations may be used as reference on a specification sheet of a product. Thus the output of an inexpensive car audio amplifier is limited by the voltage of the alternator. In most actual car systems, the amplifiers are connected in a bridge-tied load configuration, and speaker impedances are no higher than 4 Ω. High-power car amplifiers use a DC-to-DC converter to generate a higher supply voltage. 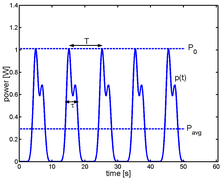 A voltage waveform and its corresponding power waveform (resistive load). RMS voltage in blue, peak power in red, average power in green. Continuous average sine wave power ratings are a staple of performance specifications for audio amplifiers and, sometimes, loudspeakers. As described above, the term average power refers to the average value of the instantaneous power waveform over time. As this is typically derived from the root mean square (RMS) of the sine wave voltage, it is often referred to as "RMS power" or "watts RMS", but this is incorrect: it is not the RMS value of the power waveform (which would be a larger, but meaningless, number). (The erroneous term "watts RMS" is actually used in CE regulations.) This is also referred to as the nominal value, there being a regulatory requirement to use it. Continuous (as opposed to "momentary") implies that the device can function at this power level for long periods of time; that heat can be removed at the same rate it is generated, without temperature building up to the point of damage. On May 3, 1974, the Federal Trade Commission (FTC) instated its Amplifier Rule to combat the unrealistic power claims made by many hi-fi amplifier manufacturers. This rule prescribes continuous power measurements performed with sine wave signals for advertising and specifications of amplifiers sold in the US. (See more in the section Standards at the end of this article). This rule was amended in 1998 to cover self-powered speakers such as are commonly used with personal computers (see examples below). Typically, an amplifier's power specifications are calculated by measuring its RMS output voltage, with a continuous sine wave signal, at the onset of clipping—defined arbitrarily as a stated percentage of total harmonic distortion (THD), usually 1%, into specified load resistances. Typical loads used are 8 and 4 ohms per channel; many amplifiers used in professional audio are also specified at 2 ohms. Considerably more power can be delivered if distortion is allowed to increase; some manufacturers quote maximum power at a higher distortion, like 10%, making their equipment appear more powerful than if measured at an acceptable distortion level. Continuous power measurements do not actually describe the highly varied signals found in audio equipment (which could vary from high crest factor instrument recordings down to 0 dB crest factor square waves) but are widely regarded as a reasonable way of describing an amplifier's maximum output capability. For audio equipment, this is nearly always the nominal frequency range of human hearing, 20 Hz to 20 kHz. In loudspeakers, thermal capacities of the voice coils and magnet structures largely determine continuous power handling ratings. However, at the lower end of a loudspeaker's usable frequency range, its power handling might necessarily be derated because of mechanical excursion limits. For example, a subwoofer rated at 100 watts may be able to handle 100 watts of power at 80 hertz, but at 25 hertz it might not be able to handle nearly as much power since such frequencies would, for some drivers in some enclosures, force the driver beyond its mechanical limits much before reaching 100 watts from the amplifier. Peak power refers to the maximum of the instantaneous power waveform, which, for a sine wave, is always twice the average power. For other waveforms, the relationship between peak power and average power is the peak-to-average power ratio (PAPR). The peak power of an amplifier is determined by the voltage rails and the maximum amount of current its electronic components can handle for an instant without damage. This characterizes the ability of equipment to handle quickly changing power levels, as many audio signals have a highly dynamic nature. It always produces a higher value than the average power figure, however, and so has been tempting to use in advertising without context, making it look as though the amp has twice the power of competitors. Total system power is a term often used in audio electronics to rate the power of an audio system. Total system power refers to the total power consumption of the unit, rather than the power handling of the speakers or the power output of the amplifier. This can be viewed as a somewhat deceptive marketing ploy, as the total power consumption of the unit will of course be greater than any of its other power ratings, except for, perhaps, the peak power of the amplifier, which is essentially an exaggerated value anyway. Shelf stereos and surround sound receivers are often rated using total system power. One way to use total system power to get a more accurate estimate of power is to consider the amplifier class which would give an educated guess of the power output by considering the efficiency of the class. For example, class AB amplifiers can vary widely from 25% to 75% efficiency while Class D amps are much higher at 80% to 95%. An exceptionally efficient Class D amp, the ROHM BD5421efs, operates at 90% efficiency. In some cases, an audio device may be measured by the total system power of all its loudspeakers by adding all their peak power ratings. Many home theater in a box systems are rated this way. Often low-end home theater systems' power ratings are taken at a high level of harmonic distortion as well; as high as 10%, which would be noticeable. PMPO, which stands for Peak Music Power Output or Peak momentary performance output, is a much more dubious figure of merit, of interest more to advertising copy-writers than to consumers. The term PMPO has never been defined in any standard, but it is often taken to be the sum of some sort of peak power for each amplifier in a system. Different manufacturers use different definitions, so that the ratio of PMPO to continuous power output varies widely; it is not possible to convert from one to the other. Most amplifiers can sustain their PMPO for only a very short time, if at all; loudspeakers are not designed to withstand their stated PMPO for anything but a momentary peak without serious damage. Perceived "loudness" varies approximately logarithmically with acoustical output power. The change in perceived loudness as a function of change in acoustical power is dependent on the reference power level. It is both useful and technically accurate to express perceived loudness in the logarithmic decibel (dB) scale that is independent of the reference power, with a somewhat straight-line relationship between 10 dB changes and doublings of perceived loudness. The approximately logarithmic relationship between power and perceived loudness is an important factor in audio system design. Both amplifier power and speaker sensitivity affect the maximum realizable loudness. Standard measurement practice of speaker sensitivity is driving 1 watt electrical power to the source, with the receiver 1 meter away from the source, and measuring the resulting acoustical power in dB relative to the threshold of hearing (defined as 0 dB). Sensitivity is typically measured either suspended in an anechoic chamber in 'free space' (for full range speakers), or with the source and receiver outside on the ground in 'half space' (for a subwoofer). While a doubling/halving of perceived loudness corresponds to approximately 10 dB increase/decrease in speaker sensitivity, it also corresponds to approximately 10X multiplication/division of acoustical power. Even a relatively modest 3 dB increase/decrease in sensitivity corresponds to a doubling/halving of acoustical power. When measuring in 'half space', the boundary of the ground plane cuts the available space that the sound radiates into in half and doubles the acoustical power at the receiver, for a corresponding 3 dB increase in measured sensitivity, so it is important to know the test conditions. ±3 dB change in measured sensitivity also corresponds to a similar doubling/halving of electrical power required to generate a given perceived loudness, so even deceptively 'minor' differences in sensitivity can result in large changes in amplifier power requirement. This is important because power amplifiers become increasingly impractical with increasing amplifier power output. Many high quality domestic speakers have a sensitivity between ~84 dB and ~94 dB, but professional speakers can have a sensitivity between ~90 dB and ~100 dB. An '84 dB' source would require a 400-watt amplifier to produce the same acoustical power (perceived loudness) as a '90 dB' source being driven by a 100-watt amplifier, or a '100 dB' source being driven by a 10 watt amplifier. A good measure of the 'power' of a system is therefore a plot of maximum loudness before clipping of the amplifier and loudspeaker combined, in dB SPL, at the listening position intended, over the audible frequency spectrum. The human ear is less sensitive to low frequencies, as indicated by Equal-loudness contours, so a well-designed system should be capable of generating relatively higher sound levels below 100 Hz before clipping. Like perceived loudness, speaker sensitivity also varies with frequency and power. The sensitivity is measured at 1 watt to minimize nonlinear effects such as power compression and harmonic distortion, and averaged over the usable bandwidth. The bandwidth is often specified between the measured '+/-3 dB' cutoff frequencies where the relative loudness becomes attenuated from the peak loudness by at least 6 dB. Some speaker manufacturers use '+3 dB/-6 dB' instead, to take into account the real-world in-room response of a speaker at frequency extremes where the floor/wall/ceiling boundaries may increase the perceived loudness. Speaker sensitivity is measured and rated on the assumption of a fixed amplifier output voltage because audio amplifiers tend to behave like voltage sources. Sensitivity can be a misleading metric due to differences in speaker impedance between differently designed speakers. A speaker with a higher impedance may have lower measured sensitivity and thus appear to be less efficient than a speaker with a lower impedance even though their efficiencies are actually similar. Speaker efficiency is a metric that only measures the actual percentage of electrical power that the speaker converts to acoustic power and is sometimes a more appropriate metric to use when investigating ways to achieve a given acoustic power from a speaker. Adding an identical and mutually coupled speaker driver (much less than a wavelength away from each other) and splitting the electrical power equally between the two drivers increases their combined efficiency by a maximum of 3 dB, similar to increasing the size of a single driver until the diaphragm area doubles. Multiple drivers can be more practical to increase efficiency than larger drivers since frequency response is generally proportional to driver size. System designers take advantage of this efficiency boost by using mutually coupled drivers in a speaker cabinet, and by using mutually coupled speaker cabinets in a venue. Each doubling of total driver area in the array of drivers brings ~3 dB increase in efficiency until the limit where the total distance between any two drivers of the array exceeds ~1/4 wavelength. Power handling capability is also doubled when the number of drivers doubles, for a maximum realizable increase of ~6 dB in total acoustic output per doubling of mutually coupled drivers when the total amplifier power is also doubled. Mutual coupling efficiency gains become difficult to realize with multiple drivers at higher frequencies because the total size of a single driver including its diaphragm, basket, waveguide or horn may already exceed one wavelength. Sources that are much smaller than a wavelength behave like point sources that radiate omnidirectionally in free space, whereas sources larger than a wavelength act as their own 'ground plane' and beam the sound forward. This beaming tends to make high frequency dispersion problematic in larger venues, so a designer may have to cover the listening area with multiple sources aimed in various directions or placed in various locations. Likewise, speaker proximity much less than 1/4 wavelength to one or more boundaries such as floor/walls/ceiling can increase the effective sensitivity by changing free space into half space, quarter space, or eighth space. When the distance to boundaries is > 1/4 wavelength, delayed reflections can increase the perceived loudness but can also induce ambient effects such as comb filtering and reverberation that can make the frequency response uneven across a venue or make the sound diffuse and harsh, especially with smaller venues and hard reflective surfaces. Sound absorbing structures, sound diffusing structures, and digital signal processing may be employed to compensate for boundary effects within the designated listening area. The term "Music Power" has been used in relation to both amplifiers and loudspeakers with some validity. When live music is recorded without amplitude compression or limiting, the resulting signal contains brief peaks of much higher amplitude (20 dB or more) than the mean, and since power is proportional to the square of signal voltage their reproduction would require an amplifier capable of providing brief peaks of power around a hundred times greater than the average level. Thus, the ideal 100-watt audio system would need to be capable of handling brief peaks of 10,000 watts in order to avoid clipping (see Programme levels). Most loudspeakers are in fact capable of withstanding peaks of several times their continuous rating (though not a hundred times) since thermal inertia prevents the voice coils from burning out on short bursts. It is therefore, acceptable, and desirable, to drive a loudspeaker from a power amplifier with a higher continuous rating several times the steady power that the speaker can withstand, but only if care is taken not to overheat it; this is difficult, especially on modern recordings which tend to be heavily compressed and so can be played at high levels without the obvious distortion that would result from an uncompressed recording when the amplifier started clipping. An amplifier can be designed with an audio output circuitry capable of generating a certain power level, but with a power supply unable to supply sufficient power for more than a very short time, and with heat sinking that will overheat dangerously if full output power is maintained for long. This makes good technical and commercial sense, as the amplifier can handle music with a relatively low mean power, but with brief peaks; a high 'music power' output can be advertised (and delivered), and money saved on the power supply and heat sink. Program sources that are significantly compressed are more likely to cause trouble, as the mean power can be much higher for the same peak power. Circuitry which protects the amplifier and power supply can prevent equipment damage in the case of sustained high power operation. More sophisticated equipment usually used in a professional context has advanced circuitry which can handle high peak power levels without delivering more average power to the speakers than they and the amplifier can handle safely. Charles "Chuck" McGregor, while serving as senior technologist for Eastern Acoustic Works, wrote a guideline for professional audio purchasers wishing to select properly sized amplifiers for their loudspeakers. Chuck McGregor recommended a rule of thumb in which the amplifier's maximum power output rating was twice the loudspeaker's continuous (so-called "RMS") rating, give or take 20%. In his example, a loudspeaker with a continuous power rating of 250 watts would be well-matched by an amplifier with a maximum power output within the range of 400 to 625 watts. For "carefully monitored applications where peak transient capability must be maintained, a system should be powered with an amplifier capable of delivering twice its IEC rating." As an example, a studio monitor rated at 300 watts IEC, can be safely driven by a 600 watts (RMS) amplifiers, provided that "peak signals are normally of such short duration that they hardly stress the system's components". For "routine application where high continuous, but non-distorted, output is likely to be encountered, a system should be powered with an amplifier capable of delivering the IEC rating of the system". This includes most consumer systems. "Such systems can often be inadvertently overdriven, or can go into feedback. When powered with an amplifier equal to their IEC rating, the user is guaranteed of safe operation." "For musical instrument application, where distorted (overdriven) output may be a musical requirement, the system should be powered with an amplifier capable of delivering only one-half of the IEC rating for the system." This necessary because, for example, an amplifier normally outputting "300 watts of undistorted sinewave" can reach closer to 600 watts of power when clipping (i.e. when its output is closer to a square wave). If such a scenario is plausible, then for safe operation of the loudspeaker, the amplifier's (RMS) rating must no more than half the IEC power of the loudspeaker. Active speakers comprise two or three speakers per channel, each fitted with its own amplifier, and preceded by an electronic crossover filter to separate the low-level audio signal into the frequency bands to be handled by each speaker. This approach enables complex active filters to be used on the low level signal, without the need to use passive crossovers of high power handling capability but limited rolloff and with large and expensive inductors and capacitors. An additional advantage is that peak power handling is greater if the signal has simultaneous peaks in two different frequency bands. A single amplifier has to handle the peak power when both signal voltages are at their crest; as power is proportional to the square of voltage, the peak power when both signals are at the same peak voltage is proportional to the square of the sum of the voltages. If separate amplifiers are used, each must handle the square of the peak voltage in its own band. For example, if bass and midrange each has a signal corresponding to 10 W of output, a single amplifier capable of handling a 40 W peak would be needed, but a bass and a treble amplifier each capable of handling 10 W would be sufficient. This is relevant when peaks of comparable amplitude occur in different frequency bands, as with wideband percussion and high-amplitude bass notes. For most audio applications more power is needed at low frequencies. This requires a high-power amplifier for low frequencies (e.g., 200 watts for 20–200 Hz band), lower power amplifier for the midrange (e.g., 50 watts for 200 to 1000 Hz), and even less the high end (e.g. 5 watts for 1000–20000 Hz). Proper design of a bi/tri amplifier system requires a study of driver (speaker) frequency response and sensitivities to determine optimal crossover frequencies and power amplifier powers. Peak momentary power output and peak music power output are two different measurements with different specifications and should not be used interchangeably. Manufacturers who use different words such as pulse or performance may be reflecting their own non-standard system of measurement, with an unknown meaning. The Federal Trade Commission is putting an end to this with Federal Trade Commission (FTC) Rule 46 CFR 432 (1974), affecting Power Output Claims for Amplifiers Utilized in Home Entertainment Products. In response to a Federal Trade Commission order, the Consumer Electronics Association has established a clear and concise measure of audio power for consumer electronics. They have posted an FTC approved product marking template on their web site and the full standard is available for a fee. Many believe this will resolve much of the ambiguity and confusion in amplifier ratings. There will be ratings for speaker and powered speaker system too. This specification only applies to audio amplifiers. An EU counterpart is expected and all equipment sold in the US and Europe will be identically tested and rated. This regulation did not cover automobile entertainment systems, which consequently still suffer from power ratings confusion. However, a new Approved American National Standard ANSI/CEA-2006-B which includes testing & measurement methods for mobile audio amplifiers is being slowly phased into the market by many manufacturers. DIN (Deutsches Institut für Normung, German Institute for Standardization) describes in DIN 45xxx several standards for measuring audio power. The DIN-standards (DIN-norms) are in common use in Europe. IEC 60268-2 defines power amplifier specifications including power output. ^ Sengpiel, Eberhard. "Amplifier, Loudspeaker, and Ohm". www.sengpielaudio.com. Retrieved 2016-10-28. If speaker impedance is too low [...] Too much current will run through the AV receiver's output transistors, causing the receiver to overheat and shut down. ^ a b Magazines, Hearst (1987-12-01). Popular Mechanics. Hearst Magazines. The Federal Trade Commission has long been aware of this fact, and in 1975 stepped in to halt the abuses of companies that wanted you to think your amp could launch a speaker into orbit. [...] all published power specs have to state continuous power in watts [...] the average amount of power the amp is capable of producing over an extended period of time. ^ Vawter, Richard. "Average Power in an AC Circuit". Archived from the original on 2010-03-27. Retrieved 2016-04-22. ^ "Speaker Ratings". Basic Car Audio Electronics. Retrieved 2016-04-22. ^ Lewallen, Roy (2004-11-18). ""RMS Power"" (PDF). The RMS value of power is not the equivalent heating power and, in fact, it doesn’t represent any useful physical quantity. ^ Unknown; Dawson, Stephen. "Why there is no such thing as 'RMS watts' or 'watts RMS' and never has been". Hi Fi Writer. Retrieved 2016-04-22. By contrast, RMS (root mean square) power, would have to be defined as the square root of the time average of the square of the instantaneous power, since this is what 'RMS' means. This could be done, but it is not the power as measured, and furthermore, it would have no technical significance (e.g. it doesn't measure heating power). ^ Quillen, Paul (1993). "What's RMS Power or RMS Watts?" (PDF). the Voltage that's measured is RMS Voltage, but the resulting power is Average Power and it's measured in Watts. ^ "Speaker power handling < Pro-Audio References". www.doctorproaudio.com. Retrieved 2016-10-28. Often wrongly referred to as "RMS" power, since it is derived from RMS voltage readings. RMS (root-mean-square) only makes sense on variables that have negative as well as positive values. ^ "Electrical and mechanical limits". www.linkwitzlab.com. Retrieved 2016-10-28. It should be clear [...] that amplifier power is not an issue at the low frequency end of the subwoofer range, but at high frequencies. The lowest frequency output is driver excursion limited. ^ "Power Ratings: Know What's Watt - ProAudioBlog.co.uk". ProAudioBlog.co.uk. 2015-04-13. Retrieved 2016-10-28. For a sine wave, the peak power is twice the continuous average power. ^ Luu, Tuan (March 2005). "Power Rating in Audio Amplifiers". Texas Instruments. Peak power ratings are obtained by using peak voltage. [...] If the dynamic headroom of an audio amplifier is specified at 3 dB, then the amplifier can deliver two times its average power; e.g., if the amplifier is rated for 200 W average power, then the peak power is 400 W.
^ "Speaker Selection and Amplifier Power Ratings". www.prestonelectronics.com. Retrieved 2016-10-28. In an amplifier, the maximum peak power output to a speaker is limited by the amplifier power supply. [...] In an amplifier, the peak power rating is useful for describing the maximum instantaneous limit of its capability for pulse sounds such as drumbeats and bass notes. ^ "Class-D amplifier guarantees 90% efficiency". EE Times-Asia. 2007-05-14. Retrieved 2016-04-22. ^ "Don't Get Seduced by Amplifier Power Specifications". About.com Tech. Retrieved 2016-04-22. ^ "Power Rating in Audio Amplifier (Rev. A), slea047a - TI.com". www.ti.com. Retrieved 2016-11-04. ^ "The Truth About Amplifier Power Ratings". Audioholics Home Theater, HDTV, Receivers, Speakers, Blu-ray Reviews and News. Retrieved 2016-04-22. ^ Lachenbruch, David (1963-07-20). Silly Season On in Phono Field. Nielsen Business Media, Inc. p. 33. ISSN 0006-2510. It was called "Music Power Output." So now that we have a good, workable standard, what do we see in the industry's advertising material? Something brand new. It's called — of all things — "Peak Music Power Output". ^ ProSoundWeb, Study Hall. Chuck McGregor, How Many Watts : Amps vs. Loudspeakers: The eternal question answered - what's the "right" wattage for my loudspeakers. Retrieved February 27, 2009. ^ CEA-490-A: Test Methods of Measurement for Audio Amplifiers Archived July 22, 2011, at the Wayback Machine, Federal Trade Commission (FTC) Rule, Power Output Claims for Amplifiers Utilized in Home Entertainment Products, 46 CFR 432 (1974). Accessed 2011-08-13. ^ "CEA Standard for testing mobile audio equipment". Archived from the original on 2011-07-18. Retrieved 2011-08-13. ^ "Understanding amplifier power ratings". Archived from the original on 29 June 2011. Retrieved 2011-08-13. ^ "IEC 60268-2 (preview)" (PDF). IEC. August 2008. Archived from the original (PDF) on 2012-03-19. Retrieved 2011-08-24.